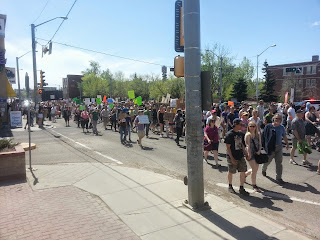 Janelle and I had a great time attending our 3rd annual March against Monsanto walk on Saturday, it was a stunning day and it was just great to see hundreds of healthy like minded people out on a beautiful day. So many good speakers and I always love the performances by the Raging Grannies. I'm really hoping to get more involved in a career that offers me something related to food security or sustainable minimalism/consumption. I just see how much happier (albeit also stressed from school work) the wife is now that she is transitioning from a career in a sterile (pun intended) "big" health system to something with a more holistic approach. I also wanted to say that I had a great time helping out at the Jon Janzen nature centre's composting ....centre? it was overcast and kind of rainy but I got to speak with several people about compost and pretty sure I convinced one guy to get out there and do it.